Once again, finally, Spring is coming back. It’s been a memorably long and severe winter, and the earliest flowers, like the forsythia, and the flowers of the Oregon grape holly, have never been more welcome. My garden had no quince shrub, and when other gardeners’ quince began to show color, plant envy led to yet another trip to the nursery. The color of quince flowers is unusual, a pink-orange-almost red that is rare in spring. In fact, I can’t think of another flower at this season that is anything like quince, hence its great allure in March. Of course the pure yellow of forsythia is an icon of early spring, so much so that I was reluctant to make it a big part of a painting. However, there was no denying the pull of the opening buds, all alone in borders and highway plantings. As for Oregon grape holly, I had never had cut branches in the studio, and didn’t know that these unassuming little flowers have a sweet, resinous fragrance that is almost like turpentine, irresistible to bees, and now to me. 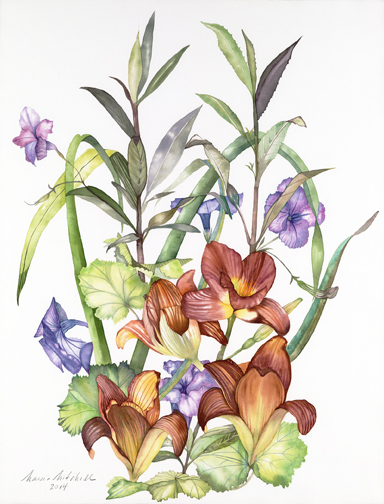 You are currently browsing entries tagged with watercolor at Marcia Mitchell.